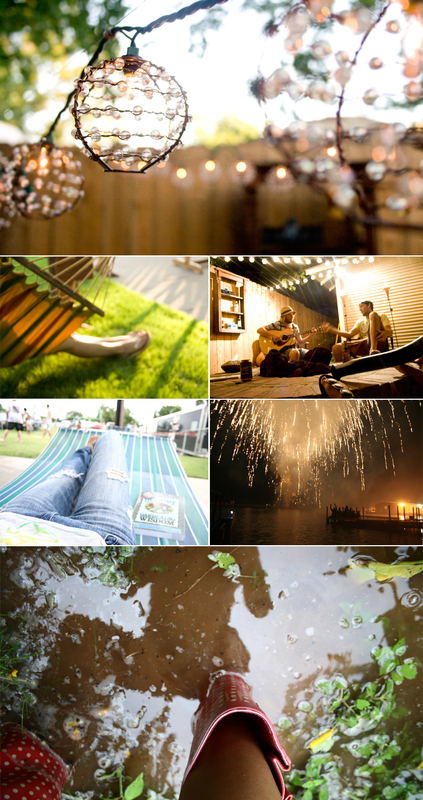 In 2010, I took a little under 13,000 photos to document our year. Narrowing it down to the 130 that bring me the most vivid memories was a little overwhelming. How can you choose a handful of moments, frozen in time, that shape us year in and out to become who we are? 2010 was about overcoming fear, negativity, struggle, insecurity, and doubt. It was about physical, and most importantly, mental strength and courage to say "I can do this." The beginning of the year brought a blanket of snow, making the world look new. 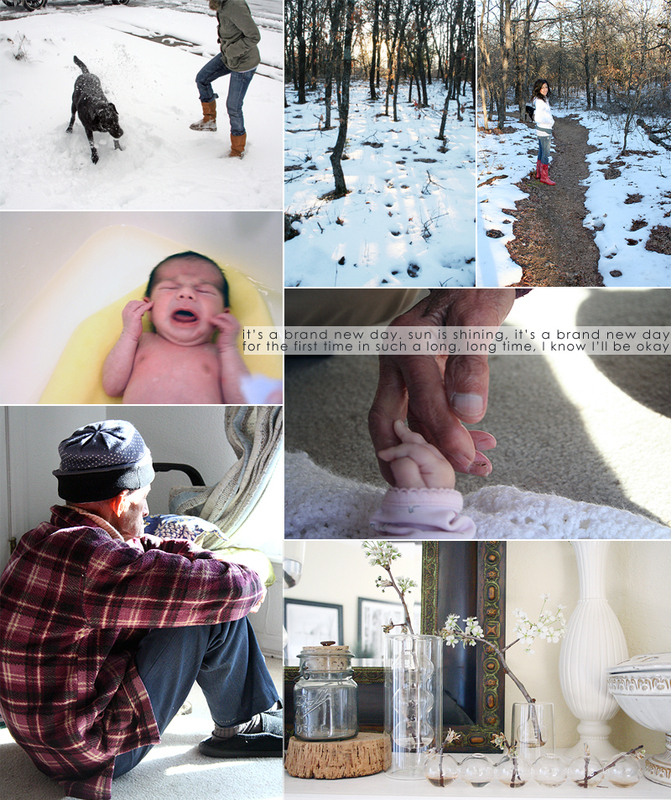 With the snow came new life, and little Brady. Time spent with family, and moments spent preparing for a new year to conquer. With Spring (1, 2, 3) came the real new year, the first day of everything coming alive again. It was the first stages of bark & leaves. And lots of days spent Backyard Farming. Spring also brought a long girls weekend out of town to see my best friend, Monica, in her beautiful city of Austin. Sometimes we tell people we've been best friends since we were 13 years old, when we met in the 7th grade. Other times we'll say we've been best friends since the day we were born. One day apart, sleeping next to each other in the same hospital nursery. The day we really met, we became life-long friends, a bond that can never be broken with the gaps of time that pass between our moments spent together, again. That weekend we walked around the city, shopped, and spent 3 muddy, Woodstocky days at Reggaefest. Dancing, and having fun in the pouring rain, with mud up to our knees. It was a trip I will never forget. 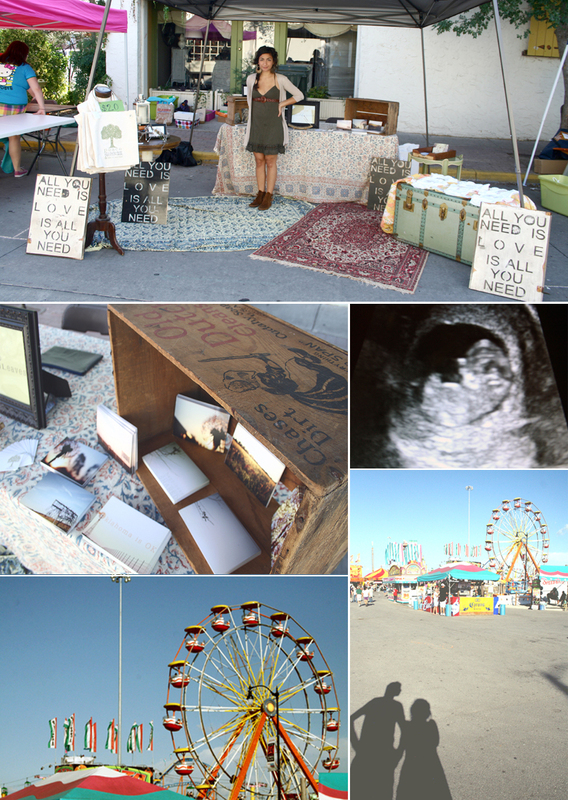 Early Summer brought my first Arts Market. Time with family (1, 2, 3) and sweet bits of Summer, beginning to make its way into our lives. Summer was time spent outdoors, hiking, fishing, gardening, and shopping at the Farmer's Market. Baby Brady, chiminea nights, Arts Festivals, Summer Breeze concerts in the park, good food, and picking Oklahoma wildflowers. Road trips across our sleepy state to watering holes, fresh fruit, and lots of lazy, Summer evenings on a blanket, watching Michael and his friends play sand volleyball while listening to music. I never complained. Patio nights, rain boots, 100 miles a week on my new shiny green bike named Elsie, outdoor concerts with friends, sweet tea, and the beautiful Oklahoma storms of Summer. Late nights with friends around the firepit, and a sleepy 4th of July. Watching fireworks from the dock, fishing, and laying in the hammock with a gardening book. All year I wait for the grass to turn green and life to start again. Over the Spring and Summer, I am truly living. Breathing in the beauty of every single day. We took three important trips, this Summer. The first in June, we were back to Austin for a long weekend. We shopped, ate amazing food, and listened to live music. We walked everywhere we went, and met some wonderful people. We went to a Reggae bar, the air thick with smoke and belly laughs. We went to a hipster hangout and watched the Givers, live. I think we were the oldest, and most non-fedora wearing ones there. We loved it, and I bought a cd and a tshirt. We went to a bar called Liberty, half indoors, half outdoors. We stayed out, under the Summer Austin stars, and ate from an old bus that served the most amazing food I've ever eaten. I wanted to memorize the menu. We laid like lizards in the sun, and swam until we were prunes. We climbed cliffs and jumped from 20 foot ledges. I learned to fly, close my eyes, breathe, and take my first steps in this world without feet. I learned to find calm in my heart, surf, and to search for the most simple joys of life. 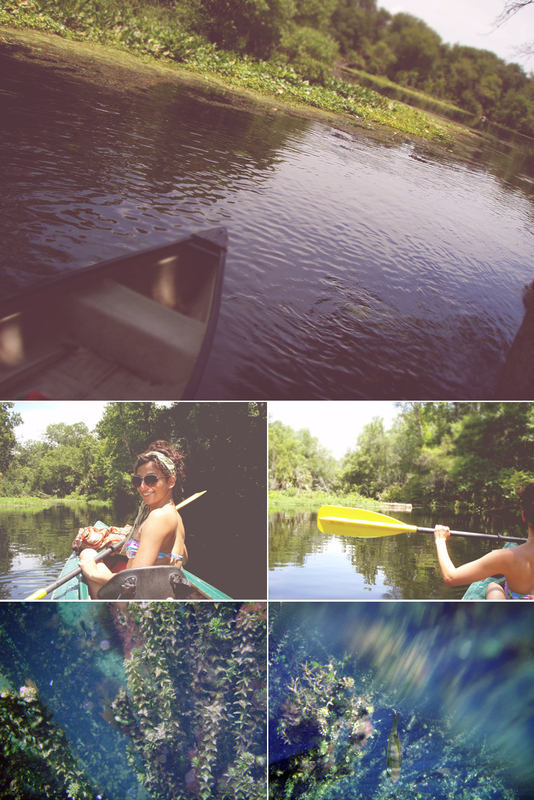 We kayaked in a swamp, found alligators, and peered at all the creatures in the water. In July, we headed to Colorado for a backpacking and camping trip. It was a very important trip for us. Full of adventure, courage, and necessity to push myself to places I didn't know I could go. To put aside fear, doubt, and struggle. When we got home, we found out we'd brought home a little souvenir. The end of Summer brought a time to say good bye, to those sweet few months that made our year what it was. We put together all of our favorite memories into one video, that we will show our little bird when she is old enough. It was the Summer she came to be. In the Fall we celebrated 4 years of marriage, had lots of lazy, perfectly imperfect days to rest and start growing this baby, good comfort food, Thanksgiving with our families, and turning 28. We also announced to our families that the littlest adventurer was indeed a little girl, just like every one suspected. We filled a giant balloon with pink confetti, and in front of our family, Grandpa popped the balloon as the air (and wood floors) were littered with her first hello. At the end of the year, baby Brady turned 1 year old. We celebrated the holidays with our families, snuggled by fires, and drank lots of hot chocolate. These last few months have been a quiet, welcome change to the adventures of Summer. My body is growing tired and sluggish with each month that passes, and in a couple weeks I will be entering my 3rd, and last trimester of this pregnancy. And that was our year, friends. 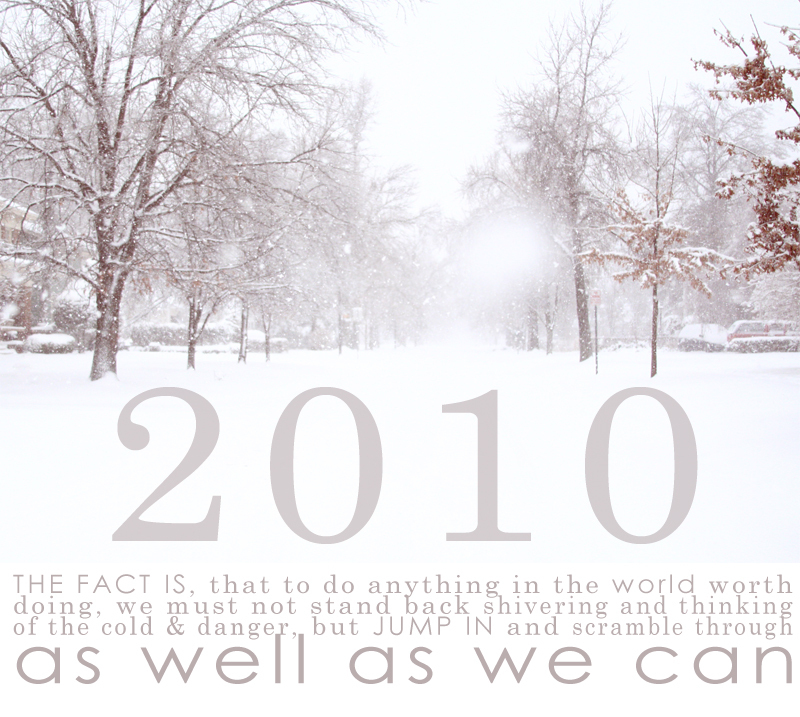 So here we are, the 4th day of the new year and today I will finally set my resolution for 2011. It will be one that I learned in 2010, and will continue to take with me every day into the new year. This year, my resolution is to just live. Freely, with happiness, gratitude, and renewed enthusiasm for our ability to shape each and every day how we choose it to be. What a wonderful post! 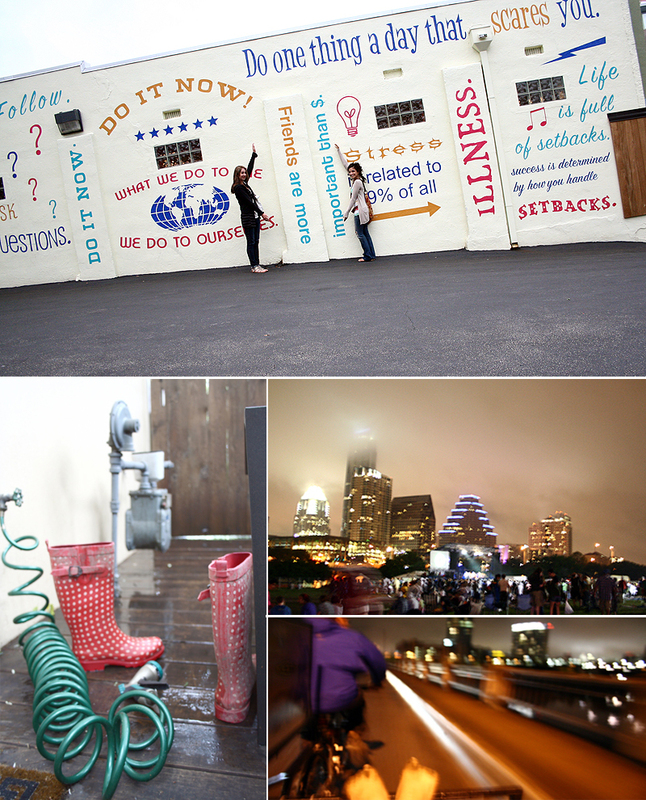 Yay for long photo posts and yay for end of year recap! Happy new year to you, love. I'm also awaiting my little one this year, actually.. in 8wks or less he'll be here. So excited!! I adore the picture of you on your husbands feet. Your posts always put me in a happy calm state. Thanks for writing and taking pictures. Aura, your pictures are breathtaking! Happy 2011! Happy new year to you and yours too Aura! Thanks for your wonderful blog. It's very inspiring. I can't wait to read all you have to write this coming year! It is my goal (because of you) to get this family outside more this year, to leave our backyard often. It is really easy to let the Florida summer trap you in AC all day. Inspiring as always. Happy New Year to you. This post was so inspirational! And your photography is gorgeous! oh my gosh! i spy a certain coffee shop and music school.....so fun to see pics of my hometown when i'm in faraway places (like poland, currently). What an amazing year you had! Your resolution is good, everyone should follow this one. How you store all these pictures, 13k sounds like a looooot of pictures compared to my small amount =) And i don't know what to do with all, where to keep safe as i don't want to lose these. I wish all the best for your family for this new year, it will be full of adventures with the baby girl. Such a beautiful post, Aura! I always love reading your blog for your amazing pictures, so this post was by far one of my favorites. What a great retrospect of your year!. Your photos are always so poetic!.Congrats on that beautiful baby!. Aura, Your photos are beautiful. I especially love the ones of you and Monica! What an amazing year you've had! These are lovely pictures as always! Can't wait to see what 2011 brings you! Lovely. Your photography is amazing. b) Your nephew is so adorable! c) Favorite picture is the one where you're arching back on Michael's feet. Too cool! Be blessed in '11, Aura! I also just recently did a recap of my own year if you care to see! Aura, what a wonderful year! Thank you so much for sharing and inspiring me to take heart the little moments in the grand scheme. Many Blessings in 2011! what a beautiful recap! you have such beautiful images to capture it all..my iphone snaps need an upgrade! By the way you are a beautiful mom to be. I wish that I'd felt half as lovely as you look when I was expecting. Love the year review in photos. Especially LOVE the way you told your family you were expecting a girl with the balloon and GRANDPA got to pop it, so creative! I'm sure your family is just ecstatic. Your photos are breathtakingly beautiful! I wanted to choose a favorite but it was too hard to choose just one. Thanks for such a beautiful post, and cheers to a new year! I love all your pictures, they are always so beautiful. Your pregnancy has made you even more radiant than you already are. I can't wait to see you little baby girl! She is going to be GORGEOUS! Beautiful photos...your posts always inspire me with my own photography. And congratulations on getting your own business up and running. The website looks fantastic! I, too, have dreams of having my own business. Ever since I saw this little book store/tea room in Crested Butte, I have wanted to have my own little store in a small mountain town. If you've never been to Crested Butte, you should visit next time you are in CO. I think you would love it! 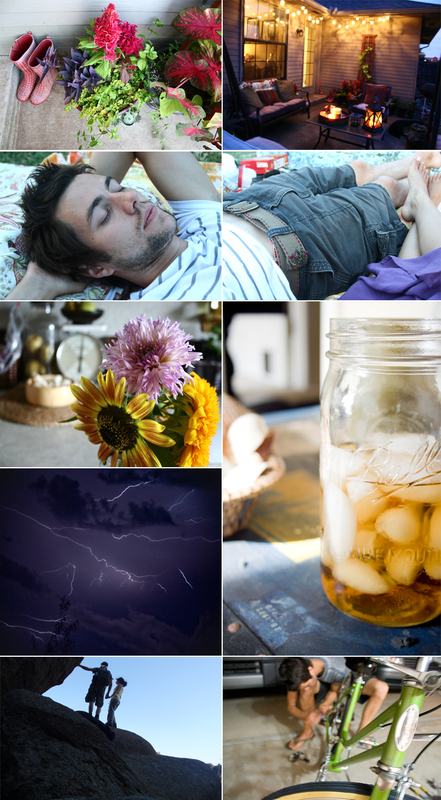 Aura- As always, beautiful photos and great post. 13,000 pictures!! What is your secret for organizing all those photos?? How many do you print? How do you store your photos? Albums? Photo books? woah! i want the recipe for whatever is in the bowl with rice! your photos are amazing as usual...I need to work on my photography skills in 2011! I also love that "Oklahoma is OK" picture! I would love to buy it and hang it in my house! a beautiful recap and a great resolution...happy new year! What a wonderful post Aura! I just found your blog not too long ago, and I love your words and pictures. I also live in Oklahoma, and I love it here. It's definitely not perfect, but it's home. I love that you love it too:) Happy New Year. I woke up this morning feeling very~~uninspired...Thank you for getting me out of that way of being, I feel warmed and softened after seeing your photos. What a beautiful year you had!! Seriously lovely post! My favorite is the photo of you and Michael (your back is arched, he is holding you with his feet). I've been following your blog since July and you are sooo inspirational. So, of course, this post made me cry, like many have! 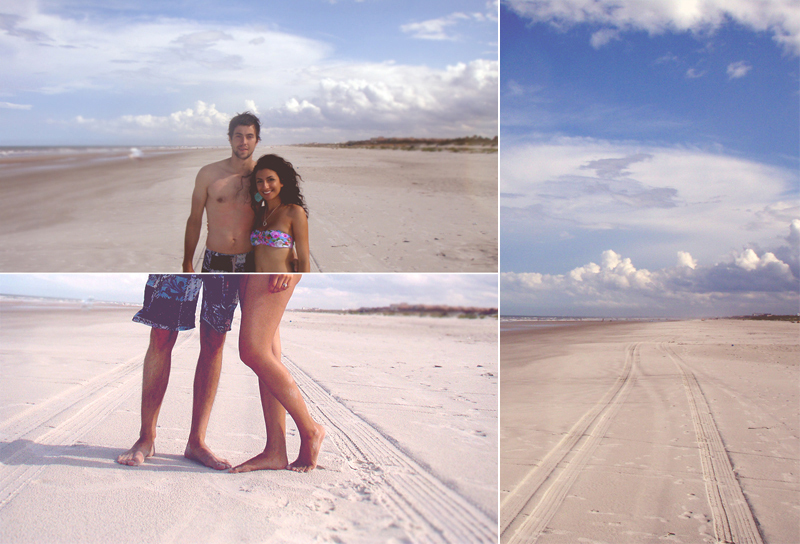 You have such a picture-perfect life! Aura, I too am inspired by you to take more photos in 2011! I don't have an SLR, though, at the moment. I hope I can still learn tips and tricks. this is such an overwhelming display of your beautiful year i coudn't look at it all in one sitting. you have such a gift for photography and for enjoying nature, i adore that. Your photos are absolutely beautiful. Thank you for sharing your journey and creativity with the world :) Congrats on your little bundle of joy too! Wow, I love all of your photos! They are beautiful! Do you mind if I use one of them in my blog? I will put a link back to you of course! I love this. What a beautiful post and so many memories to look back on and cherish. Can't wait to hear more from you soon! God bless you and your precious little family <3 you will be such a great mother and may motherhood bring with it every good gift from above. Happy 2011 to a fellow Iranian! p.s. where did you get that colorful little scarf? Thank you every one! We had a wonderful year, and I'm glad you were all reading along for me to be able to share. Thank you for always leaving such sweet notes, and your presence, in general. Ashley Noelle- There are a couple spots in Colorado that have fueled my dreams. An old book store in Manitou, a tiny row of boutiques in Colorado Springs, and the downtown shops of Boulder in particular. I'm just not sure I can brave the cold, yet :) I root for moving to Austin, and my husband roots for Colorado, more. Anonymous- I don't print a lot of my pictures. Just favorites here and there, or vacation photos. I burn them every month onto cds, and keep them in a huge case. I have from 2003 - now. And I go back and look at them all the time, so I know it's worth the troubles! Fancy- It's GUMBO! One of my all-time favorite foods. I make it so often in the colder months. Jamie Lane- That one is in an Oklahoma series I did over the Spring/Summer, and I'll have the print available, hopefully sooner than later. I probably sold more of that one in the Arts Markets I did than any other print. Anonymous #2- Of course I took lots of pictures, then, too! Maybe I should take a trip down memory lane and post some of them. I didn't start using an SLR until around 5 years ago, and I'd already been taking pictures every single day for 5 years before that. You can do some wonderful things with a point and shoot! It's just all about learning your camera inside out. Laura- I'm sorry but I don't know the name of the Lake. I know we were driving out towards Hill Country, and it was about 30 minutes from downtown. There was lots of camping and boating, and we paid a fee to get in so I suspect it's a State Park. Natalie- I don't mind at all, thank you! Helen- The scarf where I'm holding the balloon? It's from Old Navy, and I bought it over the Summer! haha, i live so close to liberty. their trailer has the best pan asian food i think. veggie heaven always gives me the shits.